After the Carribean, Puerto Rico, Cuba, and Florida were hard-hit by Hurricane Irma, its effects were felt here in Snellville, Georgia after it traveled up the west coast of Florida early last week. We lost power for almost 1.5 days in Tropical Storm Irma that came through this area. Traditional schools were closed for three days, and online schools closed for one day. If what we experienced was a tropical storm, I’ve definitely never seen a rain and wind storm whip around the trees as it did. Its amazing that more trees did not fall than actually did. In my neighborhood, alone, I counted six trees that fell after driving through my area, including a huge oak. With the heavy winds and the ground being saturated, trees with surface roots or those that were rotten fell easily. Just yesterday, in a nearby area, I observed power lines that were laying on the ground. Now, six days after the storm passed through, there are still people in my area who do not have electrical power. Seeing the news on TV and the Internet of the damage that Irma did, my heart and prayers go out to everyone who weathered it. May those who lost their lives rest in peace. May those who are cleaning up and rebuilding get the help and support they need, quickly. Mother Nature has shown that a category five hurricane is definitely something to take extremely seriously. On Monday, August 21, 2017, my son and I traveled to Clayton, Georgia to Boy Scout Camp Rainey Mountain to participate in their special event, held to witness the total solar eclipse! We met up with other boy scouts from my son’s troop, and enjoyed viewing the eclipse with about 1,000 people who were there for the event. It was an absolutely wonderful and amazing experience to be in a zone of totality to view the eclipse, even if rain clouds came through during the last 20 minutes before totality. Thankfully, we did get to see totality for a few seconds when there was a part in the rain clouds, during totality. The halo around the sun appeared to be lavender in color, through the clouds. It was really neat! And, when we experienced totality, the sky became really dark, like it was night time. Of course, the rain clouds had already caused it to become dark, though the total eclipse made it significantly dark. Though we were on the road, driving, for a total of 8.75 hours, plus stopping to eat dinner for 45 minutes, it was well, well worth it to take the day and see the total solar eclipse! I saw a partial solar eclipse when I was younger, but this was like no eclipse I’ve ever seen before. Again, it was really amazing to see totality and was well-worth the trip. I would do it again if I could, and am so happy that we had the opportunity to go and enjoy seeing the solar eclipse in totality! For more than the past week, my son and his Boy Scout Troop 3127 with the Northeast Georgia Boy Scout Council have been at the 2017 National Jamboree! There are 33 scouts in his troop, and 3 scout leaders. My son is a member of the second council contingent troop for our council; there is another troop with approximately the same number of people attending Jamboree, as well. This is a once in a lifetime opportunity to experience people from around the country, including many international scouters from around the world, who have come to the National Jamboree! I had the pleasure of visiting my son at the 2017 National Jamboree, held at the Summit Bechtel Reserve in West Virginia, near Beckley this week. While I had to leave early on Monday due to President Trump’s visit and speech at the National Jamboree, I visited all day on Tuesday. It was a wonderful experience to visit my son at the 2017 National Jamboree, and walk around (lots of walking!) the area, enjoying various exhibits, meeting people, and trading patches. I especially appreciate the presence of the West Virginia State Police and Fayetteville Sheriffs in and around the 2017 National Jamboree. It was great to observe the many police and sheriffs stationed around the area, for everyone’s safety and protection. On Monday, my son heard President Trump’s speech, after lining up to enter the speech/arena area with his troop at around 1:00 PM. It was an all-afternoon wait to hear Trump talk – and while his speech was controversial for some, he did have many good things to say to the scouts. On Tuesday, my son and I spent most of the day on Freedom Trail where the military and police exhibits are located. My son really enjoyed participating in the U.S. Army and U.S. Navy simulation experiences. He also received patches from military personnel, there, as well. While there was much walking, it was pleasant to talk with many fellow scouters at the 2017 National Jamboree! We spoke with many kind folks at different areas, including the National Eagle Scout Association Tent (where we also saw Regis the bald eagle); William T. Hornaday Award Tent; Commissioner’s Tent; and others. My son also earned a merit badge in mining – right there in coal mining country! And, he earned a religious award, a scouting award, and attended both a worship service and a mass on Sunday. He has also spent time enjoying the Sustainability Tree House. Yesterday, my son participated with his troop on a hiking trek up Garden Ground Mountain. Last Friday, his troop completed a Day of Service by painting three picnic pavilions at a local park. He has been keeping busy! There is so much to do and see, and so little time at the 2017 National Jamboree. I’m happy for the opportunity that my son and I have had to be at there! I had a great time! Two weeks ago, my son and I visited Grand Teton National Park. On our drive to Yellowstone National Park, we drove through Teton Pass; Jackson (Hole), Wyoming, and Grand Teton National Park. The views at all of these locations were beautiful and stunning! I wish we could’ve spent more time at Grand Teton – we had such a pleasant, if brief, visit there! In Jackson, we stopped at the National Park Visitor Center to shop for souvenirs and T-shirts, and found the staff there to be very pleasant and professional. Bob assisted me with my purchases. Bob’s professionalism and courtesy was of the quality to make customers such as myself want to come back. Thank you, Bob, for valuing my visit and my interest in these beautiful national parks! My son and I visited Yellowstone National Park and Grand Teton National Park in the past week. We enjoyed seeing beautiful scenery, picturesque views, and wildlife in only a few days of visiting both of these parks. Yellowstone is a huge park, with primary points of interest scattered around it. That caused much driving and time on the road to see places such as Mammoth Hot Springs; Steamboat Geyser at the Norris Geyser Area; the Roosevelt Arch; Yellowstone Lake; Grand Prismatic Spring; Mud Volcanoes; and of course, Old Faithful. We enjoyed seeing bison, elk, cranes, deer, and other wildlife. We drove to Yellowstone through Grand Teton National Park, and enjoyed amazing mountain views, beautiful lakes, and pretty wildflowers. We saw a herd of bison some miles outside of Grand Teton National Park, between Jackson, Wyoming. And, Teton Gap, driving down into Jackson was pretty amazing, too! What a view, and such pleasant weather and temperatures we enjoyed! Besides all of the driving, and delays from road construction in Yellowstone, the most unpleasant thing we experienced, overall, were interactions with park rangers. One of the first encounters with a Yellowstone park ranger was outside the Albright Visitor Center at Mammoth Hot Springs. He was a self-appointed Elk Police Officer who was totally over the top in accosting, stalking, and harassing my son and I while observing and photographing elk near the visitor center. On July 9, my son and I were at least 50 feet away from several elk and their young that were laying on the ground, yet the park ranger accosted us from his position across the street, telling us to stay away from the elk! At 50 feet away, he yelled at us to stay away from the elk, and then, he stalked and continued to harass us about it as I called to him that we were going to our car. He actually crossed the street, harassed us, and followed us to our car. He only left us alone once we got in our car. I told the guy to get lost, and he replied the same to me! Wow, what was his problem!? He was definitely extremely unprofessional, and a pathetic example of the park rangers employed at Yellowstone. That was the worst experience we had at Yellowstone, and one to cause me not to want to return. We definitely don’t need to be treated in such a horrible manner! There were also two other instances of park rangers at Yellowstone being less than professional. One accosted us from afar, again, at Old Faithful. We reached down to touch water on the boardwalk, and the guy told us we committed a “federal crime.” Really? We were on the boardwalk, and he was trying to tell us we weren’t. Was he blind? Chalk that up to another sexist male park ranger who has issues with women – or at least single women. Neither of the those rangers treated men in the same manner. On the boardwalk, a man reached down and touched water, and nothing was said to him. And, at Albright with the elk, there were two other instances of men my son and I observed who were no more than 10 feet away from the elk, taking pictures, but the Elk Cop didn’t harass or stalk them, or make them feel threatened by chasing them into their cars. Yet another park ranger refused to allow me to use a restroom in a campground. I had to drive to another location 12 miles away to use the restroom for goodness sakes! There were at least as many negative as positive interactions we had with park rangers at Yellowstone. We did have good experiences hearing rangers give talks at Steamboat Geyser and the Norris Educational Center. Thank you, Rangers Diana and Laurie, for those educational and interesting ranger talks. Your professionalism helped make our visit a little more enjoyable. My son also earned a junior ranger patch by completing the associated book; thank you to Ranger Jim for making that a positive experience for him. That stated, my son and I enjoyed a fun time at Yellowstone, overall. Visiting Jackson, Wyoming, and seeing the Teton Mountains was lovely, too. It would have been nicer, however, to photograph a few elk without being unnecessarily and unprofessionally harassed by a park ranger, especially after traveling across the country and spending $1,000s to visit Yellowstone. While Yellowstone is not my favorite park of all of the national parks I’ve visited, it was nice to see and good to have as protected land, even though some of the park rangers need to work on their people skills! 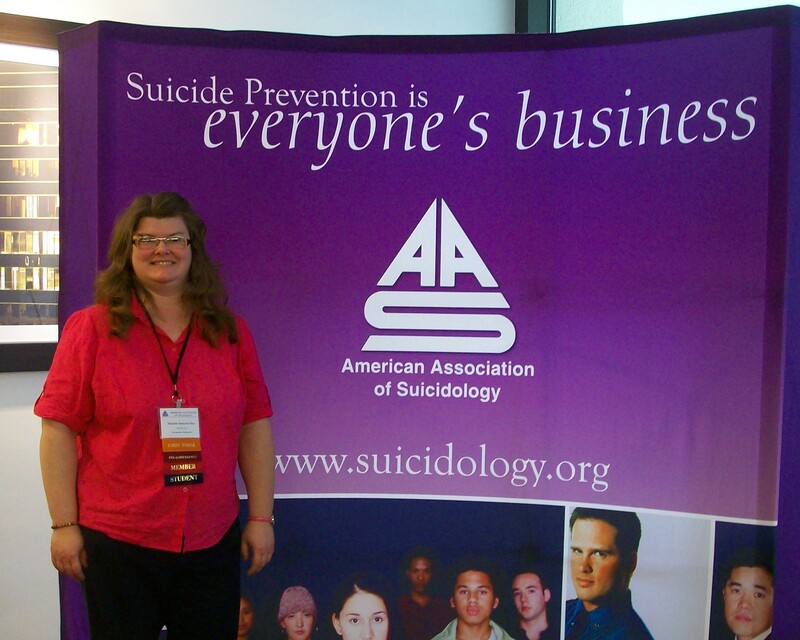 This is my second year as a member of the American Association of Suicidology. 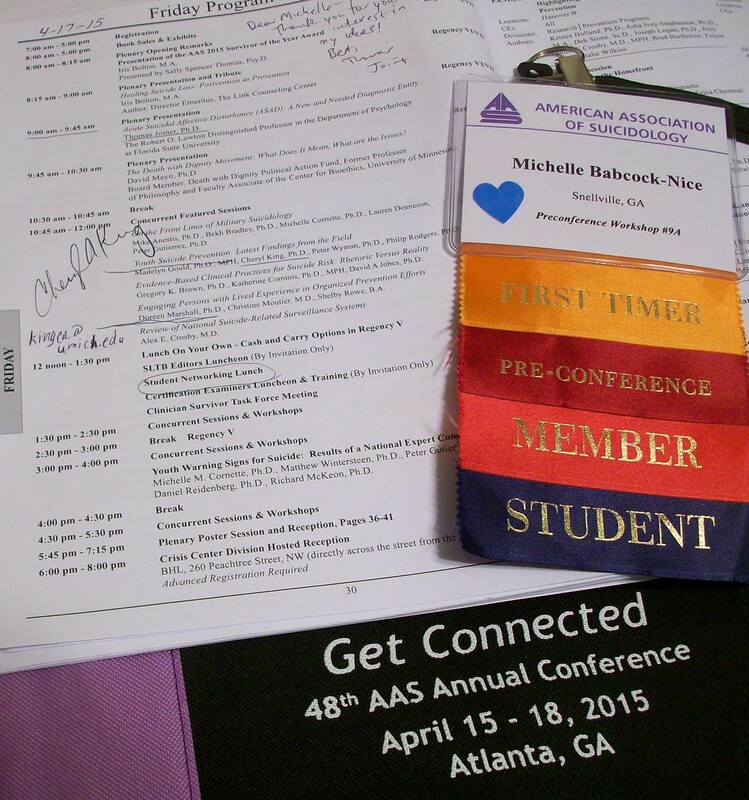 Earlier this Spring, I happened to peruse the association’s website and discovered that the annual conference was to be held in Atlanta, only a short distance from my home! How could I pass up an opportunity to attend the conference? It would have been unthinkable not to go. So, this week, I invested the equivalent of two days throughout a three-day period into hearing presentations, attending workshops, meeting colleagues, and getting photographs. 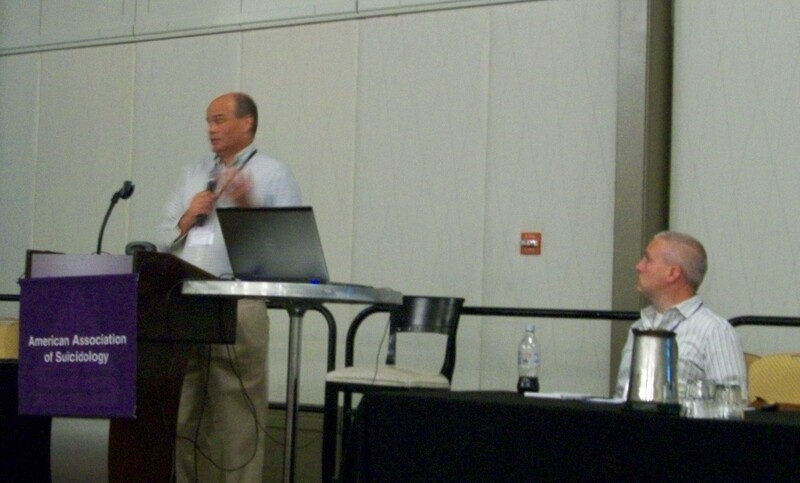 The conference was very affordable at $150, plus receiving a free student seat to a half-day preconference workshop on Tuesday, presented by Dr. Jim Mazza and Dr. Alec Miller. I wasn’t required to fly or drive in over a long distance (although driving in the downpouring rain wasn’t very pleasant on Wednesday morning), I didn’t have to shell out big bucks for a hotel stay, and I didn’t have to pay alot of money for food. I parked at a self-serve parking lot on Spring Street, just one block away from the Hyatt Regency in Atlanta, paying $4 per day for each of the three days. Yesterday, I enjoyed eating lunch at the buffet of a nearby Chinese restaurant, paying only $8.50, including tip for my meal. One thing I did miss out on today, however, was the $10 student lunch voucher. I arrived too late, and there were none left, so I had to go without. The wonderful bagels for breakfast, however, certainly made up for the lost lunch opportunity. I’m still extremely happy to have enjoyed the free student seat at Wednesday’s workshop, as well as to have met a huge presence in the field of counseling and psychotherapy, Dr. Marsha Linehan, the creator of Dialectical Behavior Therapy! 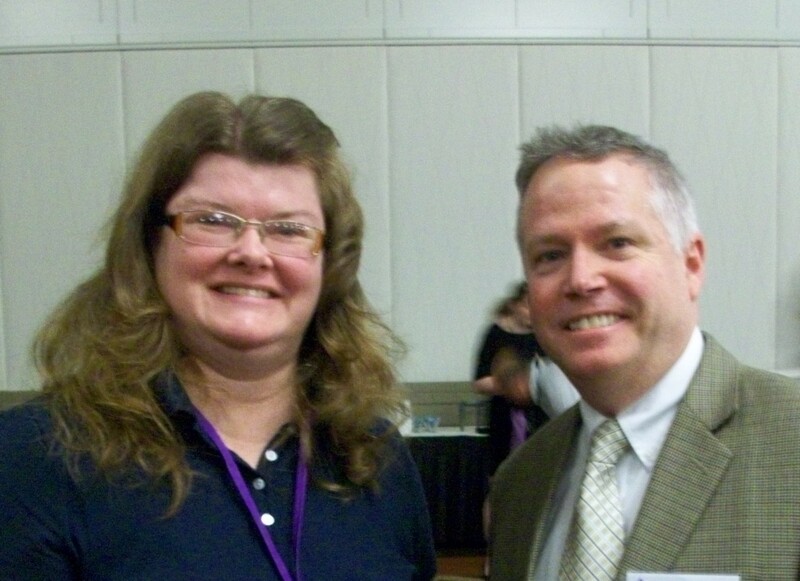 I snapped a couple of pictures of Dr. Linehan, but missed out on my chance to be photographed with her when a kind lady was unable to navigate my camera – and Dr. Linehan was in a hurry. 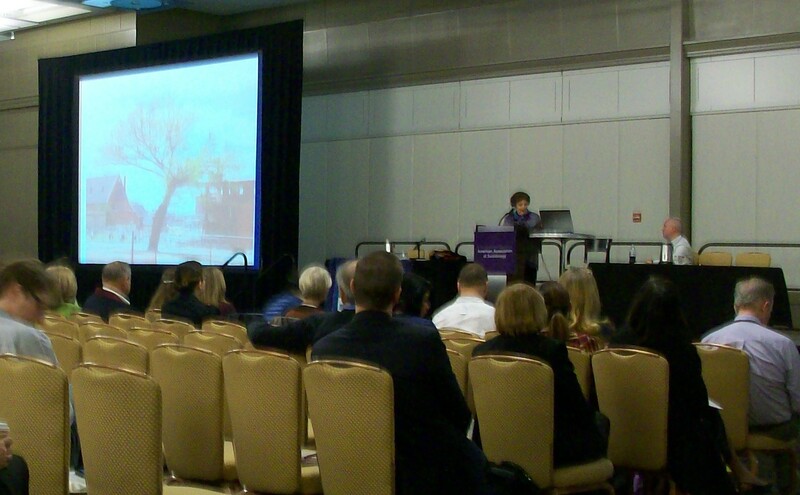 To hear her presentation about her personal background and how it relates to her creation of DBT is incredibly inspiring! There are so many additional, wonderful presenters that I heard, as well, including, but not limited to Dr. Thomas Joiner and Dr. Cheryl King (who both autographed my program booklet – thank you! ), Dr. Matt Nock, Dr. Michael Anestis (Conference Program Chair), Dr. David Miller (Association President, with whom I did get a photo! ), Kathik Dinakar, Dr. David Klonsky, Dr. Keith Hawton, Adam Horwitz, Raymond Tucker, Stephanie Pennings, Dr. Sarra Nazem, Dr. April Smith, Chris Hagan, Iris Bolton, Dr. David Mayo, Dr. Madelyn Gould, and Dr. Peter Wyman. While I did not do much networking, there were folks who I met and spoke with, making the experience more personal and enjoyable. One particular colleague with whom I networked on each of the three days I was at the conference was Stephen. Additionally, all of the staff and volunteers of the association were extremely helpful and friendly, particularly Justin, Sarah, John, and Pollyanna. All those employees of the Hyatt Regency with whom I spoke were also very friendly and professional, providing an excellent reflection of the hospitality provided by those at the hotel. 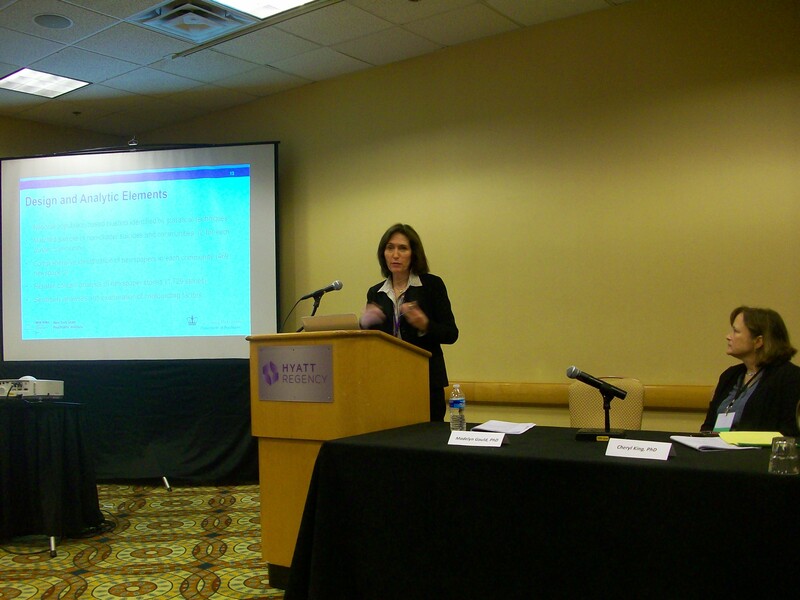 There was so much that I learned, and I’m so happy to have had the chance to attend this year’s 48th annual conference. 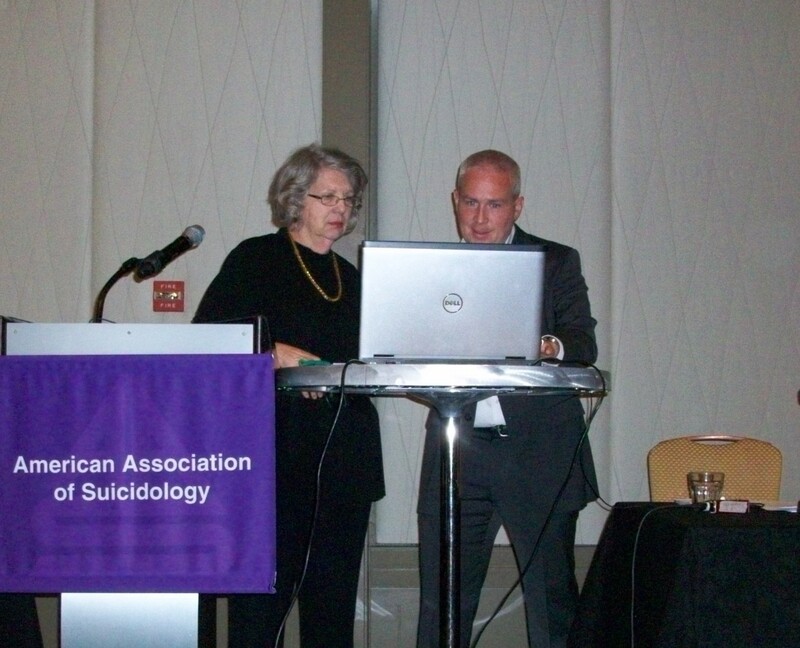 I hope that I will be a more effective, compassionate, and professional support to those who have been affected in some way by suicidality, as a result of attending this conference. Yesterday, my son and I went to see the Ringling Brothers and Barnum & Bailey Circus at the Gwinnett Arena in Duluth, Georgia! What an absolutely fabulous and fun time we had! 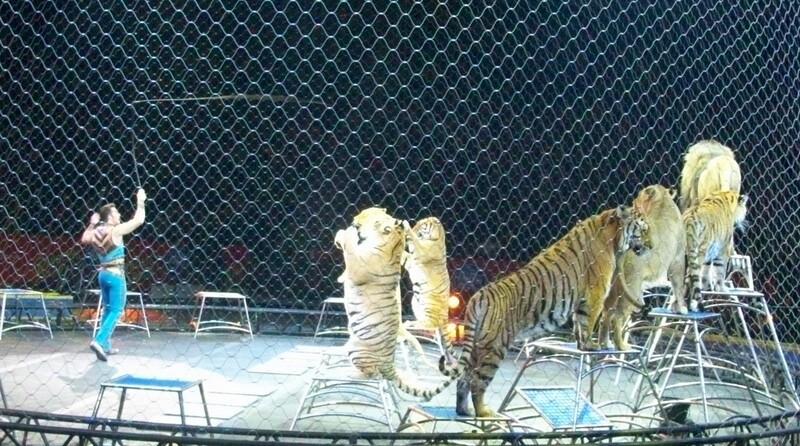 The circus performance was so much more and better than I ever imagined it would be! Oh my gosh! 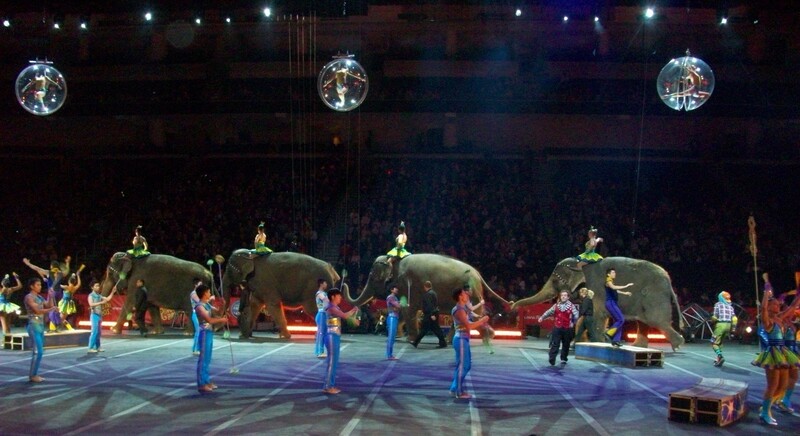 I have never seen any performance quite as amazing and incredible as that which I saw yesterday at the circus! I recommend to anyone who can go, to see these wonderful and astounding performances. At the circus, my son and I sat in the third row, right up in front. I got great tickets from StubHub.com for $25 each only a couple of days before the show. It was incredible to save about $40 on the ticket prices, and still get such fantastic seats! I still can’t believe it! The money I saved was then spent on food and souvenirs. Thank you, StubHub! 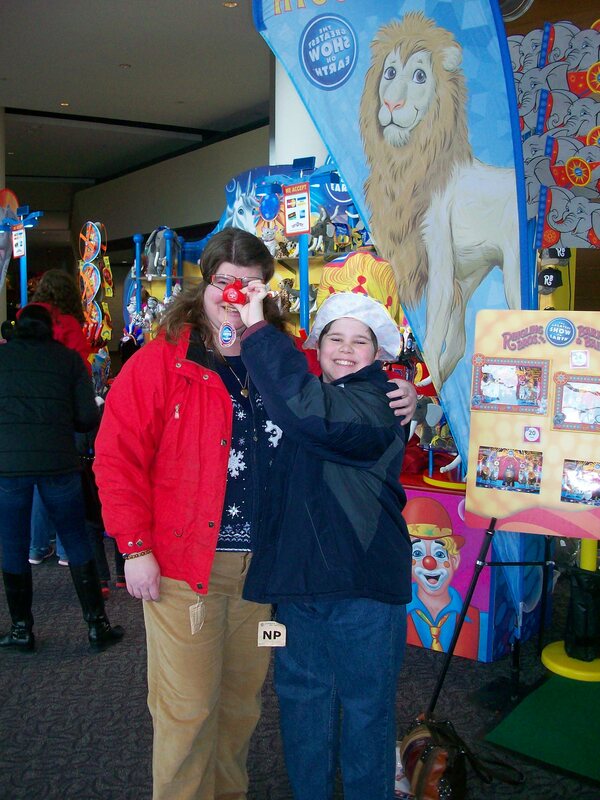 There were so many performances and shows that my son and I enjoyed seeing at the circus. 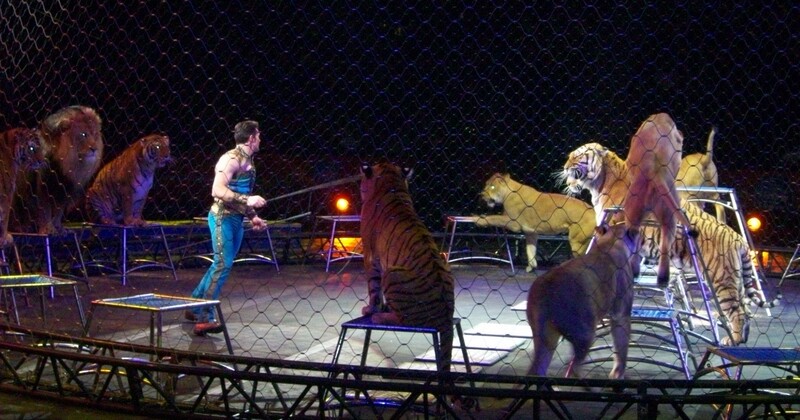 Alexander Lacey – the lion tamer – put on a great show with several lions and tigers doing many tricks. We had prime seats to watch as he rubbed a lion’s tummy, and kissed lions and tigers. 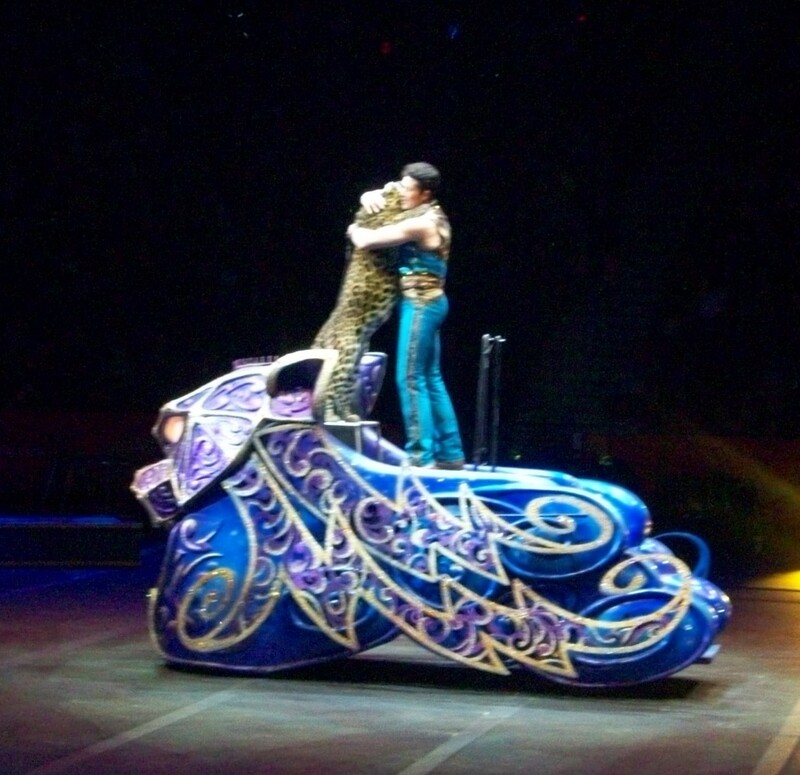 He also rode through the arena in a fancy, motorized circus car with a leopard that he hugged and kissed! We watched as Joseph Frisco, III, and Mario Bovio superbly-handled up to six elephants at a time. 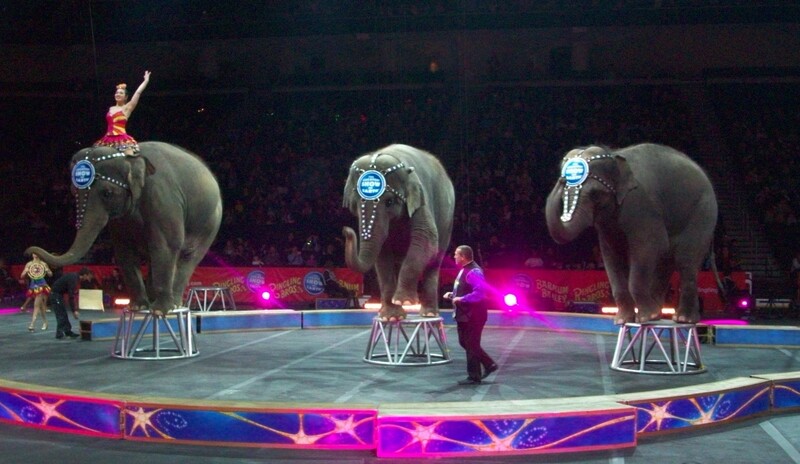 There was one portion of the show in which four elephants stood up on their hind legs, with most of them placing their front feet on the backs of the other elephants. It was really incredible to see! We saw the Tuniziani Troupe perform on the flying trapeze, with at least one performer doing a triple somersault while flying through the air. There were the men of the Chinese National Acrobatic Troupe whose acrobatics included jumping through hoops that were up to ten feet off of the floor. 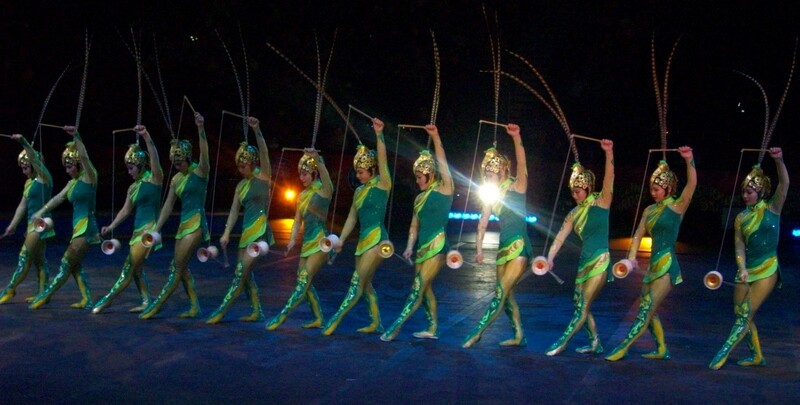 The women of the Chinese National Acrobatic Troupe skillfully spun and twirled diabolos in the air in synchrony. And, the men and women together formed a giant peacock while either riding and/or standing on top of two bicycles and each other while on the bicycles. It was pretty neat! The Torres Family, who ride motorcycles while inside a giant steel ball, left my son speechless and myself both amazed and concerned for their safety. Beginning with a group of four motorcyclists, they steadily increased their number up to eight during their final performance. 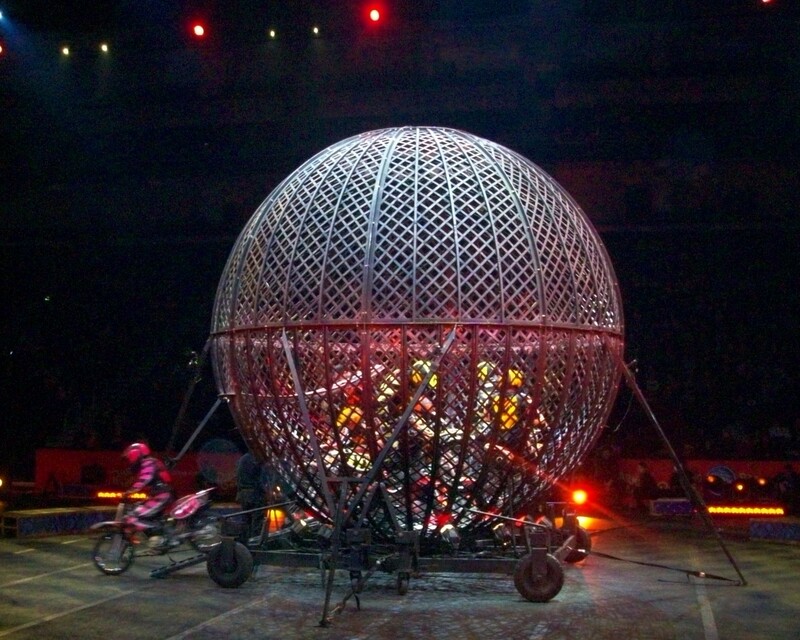 All of the motorcyclists rode in circular patterns inside the steel ball, while not having any collisions! Their performances amount to a world record achieved every day! The Tchalabaev Cossack Troupe gave astounding performances by riding their horses. These riders did not just “ride” horses by sitting on them, but also stood atop of them, sometimes standing with one foot on each of two horses galloping next to each other. There were also performances of men in the group who hung off the horses in what was called the “dead-man rag,” in which it appeared that the horses would nearly kick them. Other performers (two at a time) also climbed over and under a horse while it was galloping. They also performed a five-person pyramid while the horses were at a gallop. It was all pretty amazing! There were performances of clowns, dancers, dogs, goats, and the motorcycle highwire – which was almost directly above us, with no nets – that were also wonder-inducing. My son was amazed to watch a dog jump into a man’s arms from 16 feet off of the floor. Hans and Mariya Klose, and Vicki Zsilak and Alex Petrov, respectively, did a great job with the dogs and goats. The clowns were so funny, too, and kept us laughing. The dancers added even more vigor and vitality to the overall show. The performances of the goats, dogs, and miniature ponies were great, too. The folks on the motorcycle highwire, riding back and forth, and even spinning around the highwire, were incredible to watch. 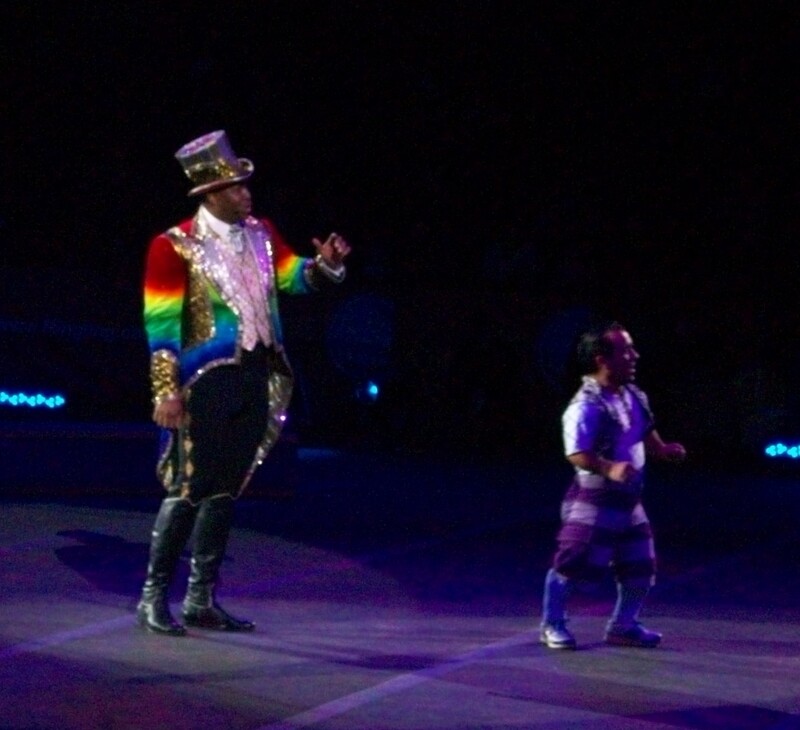 Johnathan Lee Iverson and Paulo Dos Santos, the Ringmaster and his sidekick, were the gel that pulled it all together in this cool show. 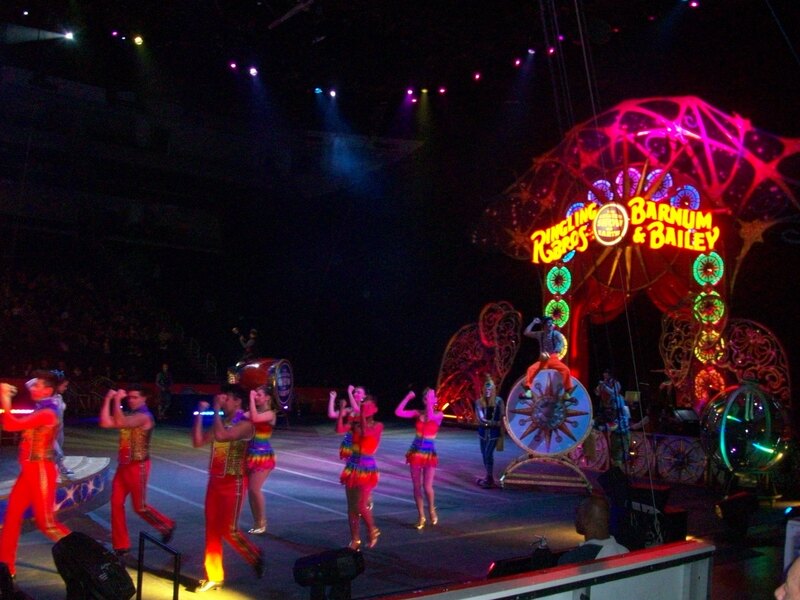 To top it all off, the Ringling Brothers Band played live music during the circus performances! 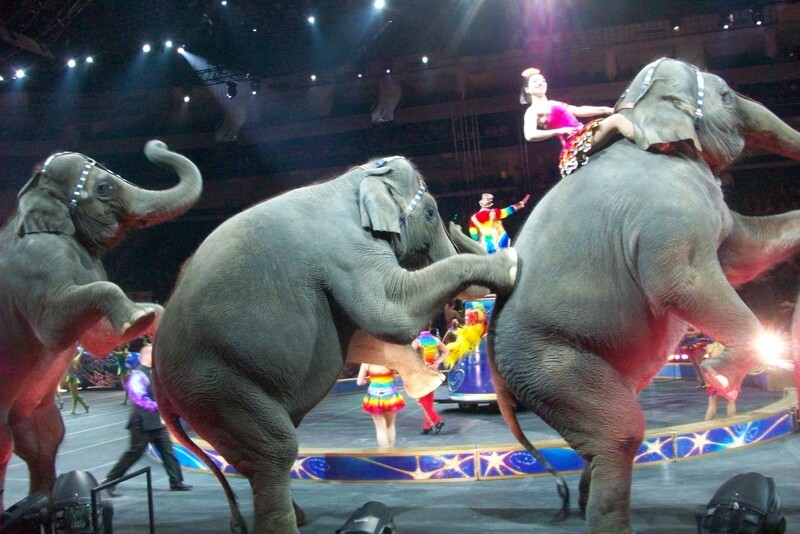 If I might have changed one thing in the circus, it would be for the elephant that wore the mammoth suit to have it removed. Elephants are such wonderful, intelligent, and sensitive creatures, and to see an elephant dressed up in a full-body costume was distressing. Certainly, the animal was alright and was not being hurt, however it leaves me to wonder how much stress it really creates in this creature. 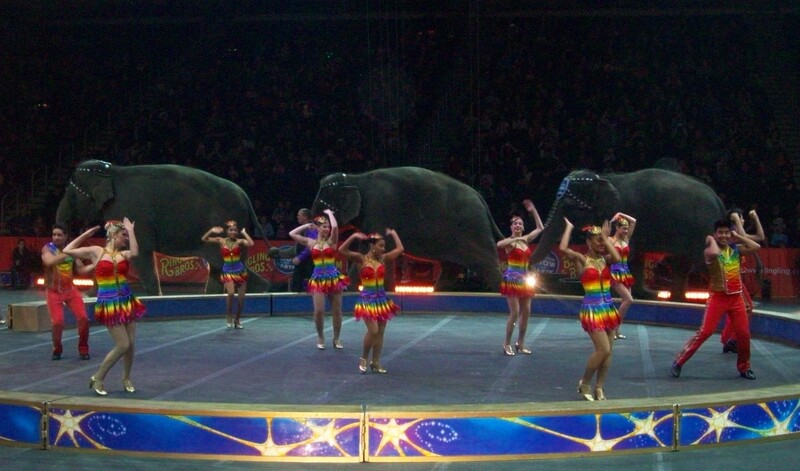 The one and only previous time that I had ever been to a circus was a Barnum & Bailey event sponsored by the Shriner’s. I went with my brother and other children on school buses when I was seven-years-old. I think I remember seeing some elephants, but we were seated so highly up in Buffalo’s War Memorial Auditorium – and because the adult chaperones with us showed absolutely no eagerness or excitement at all – I don’t remember much of it except getting separated from the group when we left. Thankfully, I was able to flag down a friendly policewoman who was directing traffic, and she took my brother and I to our school bus. That is the most I remember about going to a circus as a child – being left behind and having to step up to fend for my brother and myself amidst a sea of people. I expect that was the reason I never got to go see the circus again as a child – due to the careless “supervision” I experienced. So, one can imagine what a wonderful treat it was to take my son and watch such an incredible and breath-taking circus! Anyone who can go to and enjoy seeing the circus should do so in order to enjoy all of the wonderful and astounding performances that are in store! Thank you to Nicole and Alana Feld for producing such a wonderful show!